If you’ve been following along with some of my most recent posts you know that just last Tuesday (one week ago) I got gum graft surgery. If you’ve never heard of it that’s probably a good thing as it’s not something I wish on anyone. Gum graft surgery is a procedure done by a periodontist to heal receding gums. Your gums could be receding for many reasons, but mine was mainly due to over 8 years of orthodontic treatment when I was in my teens. Regardless of why I had to have it done, I did have to have it done, and because of the pain and stitches in my mouth, it was recommended that I only eat soft foods for the next 3 weeks. Since I’m pretty creative in the kitchen, this was no problem, and I actually did have fun coming up with new delicious smoothie and soup recipes. Upon leaving the periodontist office after my surgery, they gave me clear instructions on how to take care of my mouth and handed me a cute “goodie bag” of things they thought would be easy to eat and simple to make for the first few days. 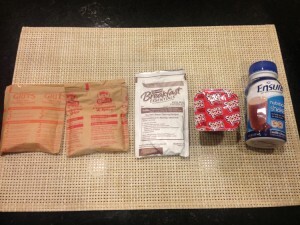 I took the bag, said thank you, and figured the contents would make for a good blog post…hahaha. Here are the items (in order) with the ingredients next to them that I would NOT eat and I highly recommend you stay away from. You will also see below that I have come up with a healthy alternative for each item, as I truly believe there is a healthy alternative for almost every single item we would like to eat. Quaker® Instant Grits Cheddar Cheese Flavor: partially hydrogenated soybean oil, corn syrup solids, hydrolyzed soy protein, monosodium glutamate, yellow 5 lake, yellow 6 lake. Wow, this stuff is just absolutely horrible. Quaker® Instant Oatmeal Cinnamon and Spice Flavor: sugar is the second ingredient and one packet contains 11 grams of sugar, which is almost 3 teaspoons of sugar. That is really no way to start your day. Carnation® Breakfast Essentials™ Chocolate Flavor: sugar is the second ingredient with a whopping 19 grams of sugar total (5 teaspoons of sugar!). It also contains wheat starch. Why this would need to be in there, I don’t know. JELL-O® Pudding Chocolate and Vanilla Mix: sugar, modified corn starch, partially hydrogenated soybean oil, artificial flavors, colors added. And just think, this is stuff that kids eat all the time…aaaahhhh! Ensure® Nutrition Shake Chocolate Flavor: sugar, corn syrup, soy oil, soy protein, canola oil. This is supposed to be considered a nutrition shake??? Geez!! Although it’s not in the picture at right, a great alternative to grits is delicious, protein-filled quinoa. Quinoa sweetened with fruit is great for breakfast or sprinkled with raw parmesan cheese is a great side dish with dinner. You can also try one of the delicious quinoa recipes in Beyond Diet. Quinoa Pilaf is one of my favorites. To avoid the sugar added to most oatmeal packets, just buy the original kind and sweeten it with berries (or any fruit you like) and if you need a little more sweet, add some raw honey or stevia. I love homemade applesauce in my oatmeal with a little cinnamon on top…delicious! I have absolutely no idea why the packet of Carnation Breakfast Essentials (what is essential about it?) says “Complete Nutritional Drink”…what??? All it is is a ton of sugar that you’re supposed to add to milk. What is so nutritious about that? 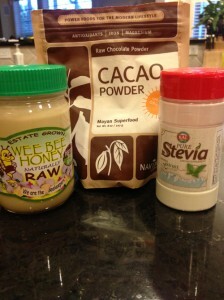 If you’re looking for a tasty way to flavor your milk and enjoy alongside a healthy breakfast, you can add raw cacao powder to organic milk, coconut milk, or almond milk with a touch of stevia or raw honey for a delicious chocolaty treat. As far as the Jell-o pudding goes, I like to make my own the healthy way. Use 1 scoop of Biotrust™ Vanilla or Chocolate Protein Powder (I like them both) and mix it with 1 tbsp of water. 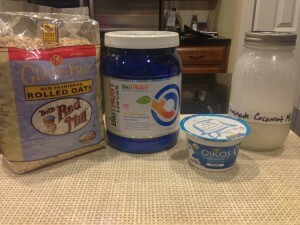 Then add 1 plain Greek yogurt (I like Oikos®, shown in the picture, above right). Voilá!Pudding the healthy way without the dangerous hydrogenated oils or sugar. Smoothies were a big part of my regimen over the past week. The list of delicious smoothie combinations is absolutely endless (as you will see in the Recipes section of Beyond Diet). One of my absolute favorite to make because it is so filling and full of nutritious ingredients is this Avocado Smoothie. The most important message I can communicate to you today is that no matter what food is tempting you, no matter what craving you have and no matter what the situation is, there is a healthy alternative! Just spend a few minutes inside the Beyond Diet Recipes section and you’ll see that healthy eating can be so simple and delicious. All you need to do is find your tasty alternatives and enjoy. What are your favorite “healthy makeovers” you’ve done on recipes, or substitutions you make for processed foods you used to eat (but now know better)? Leave your comments below.